New Austria stamps issued by the Allied Military Government (A.M.G.) of the United States, Great Britain, and France began to appear at the end of June 1945. Austria was partitioned into occupation zones by the Allies along the model that had been used for post-war Germany. The states of Lower Austria and Burgenland (and initially Styria) were controlled by the Soviet Union, the states of Upper Austria and Salzburg were controlled by the United States, the states of Styria and Carinthia were controlled by Great Britain, and the states of Vorarlberg and Tyrol were controlled by France. The new A.M.G. 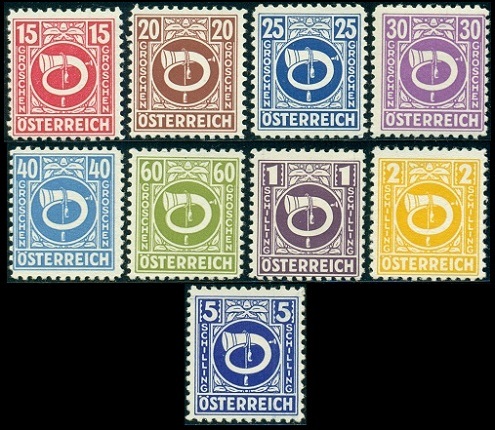 stamps were issued for use in all of the Western Austrian states occupied by the United States, Great Britain, and France. They were not valid for postage in the Soviet Union occupation zone. All of these A.M.G. 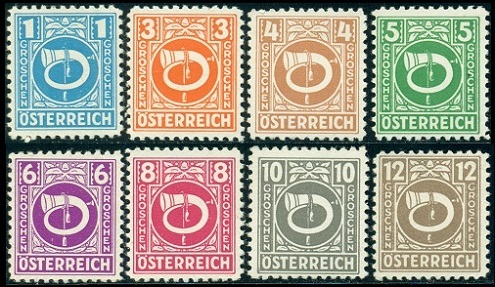 stamps were denominated in Austrian Schillings and Groschen. The seventeen stamps shown above (Mi. #721-37, Sc. #4N1-17) were printed in Washington, D.C. and issued in Austria between June and November 1945. They are all lithographed and perforated 11. This simple Allied Occupation stamp design features a post horn, with denomination numerals in the upper corners and the denomination spelled out at the sides. As mint and used examples, these stamps are very common, however, on commercial covers, they can be quite scarce. In November 1945, these stamps were replaced by the first official postage stamps of the Second Republic of Austria.